June 1954 – mid-Century in what has been typified by many as the Age of the Automobile – General Motors had just produced its 50 millionth car – Mercedes introduced the 300SL coupe, with its now famous gull-wing doors – Nash and Hudson had merged to form the American Motors Corp (AMC) – the Dow Jones Industrial Average closed at an all time high of 382.74. 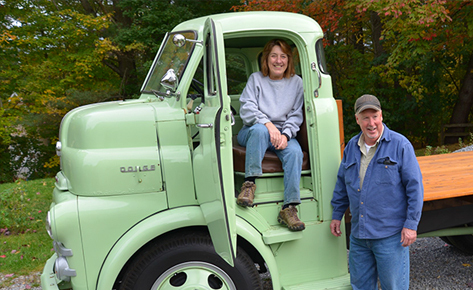 In Clearfield PA, Clark Mitchell, who was still in high school, was just starting to build his own Class H modified Crosley based sports car in the Mitchell Mills garages, his family’s business. Clark’s mechanical sensibility came from working on the Mill’s and friend’s vehicles, building & selling kayaks of his own design, and constructing & flying numerous hand-built model planes. 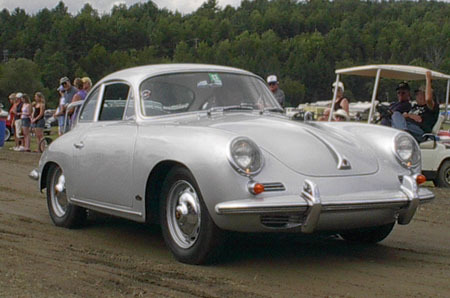 His intention being to make a basic tubular shaped, aluminum skinned body with cycle fenders, put it on the Crosley chassis and hop up the engine for more power. 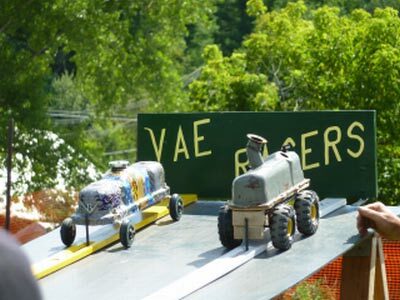 Over the preceding winter he had created several scale clay models for the national Fisher Body Craftsman’s Guild competition. His design ideas generated some real interest among his family, friends and neighbors. They were aware that he was working on creating his own ultra-lightweight sports car. Several days into his project, he had a visitor. Harry Heim stopped in at Mitchell Mills to purchase dog food for his Russian Wolf Hounds. 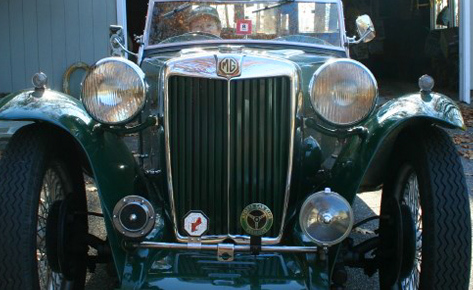 Clark’s father noticed Harry’s car was rather unusual for those parts, a Riley Healy. It was then he asked me to collaborate with him on the project car for his friend John Iglehart. 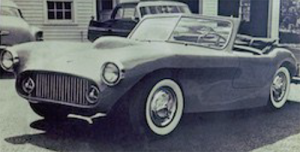 1954 Macaroni Monza I body shell, wired & ready Between that time and my attending Penn State in the fall of 1954, we were able to pull the first fiberglass body from the female mold in the Clearfield Plastics parking lot on a sunny early autumn morning. ‘Hey Harry, the way the sun is back-lighting the body, it looks like macaroni!’, Harry instantly responded, “Hey Clark, we’ll call it a ‘Macaroni Monza.’ Everybody wants to call a pseudo-sporty car a ‘Monza,’ and ours has really sporty coachwork.” At that moment Clark Mitchell’s Clearfield Classic, the original Macaroni Monza, became a reality. MM I body shell on Fiat Topolino chassis with BMC Somerset Engine and twin SU carb manifold. 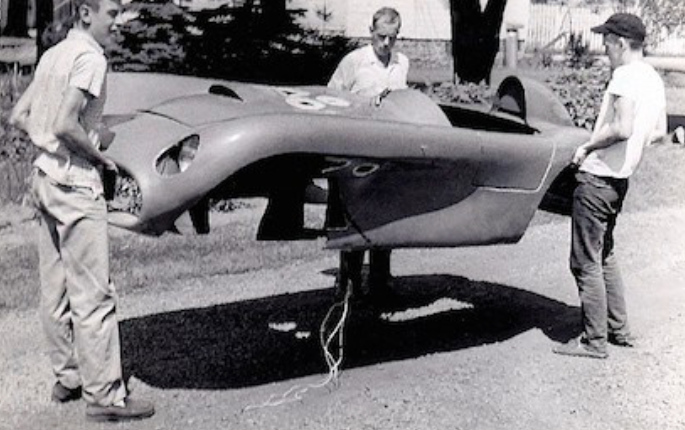 The Macaroni Monzas have gone through five phases since pulling that original fiberglass body shell – when completing the Macaroni Monza I – a larger version was fashioned by Harry Heim Associates and sold through Almquist Engineering – to a day in the early ’90s when Clark inquired of his life long friend, Roger Adam if he would sell his car. 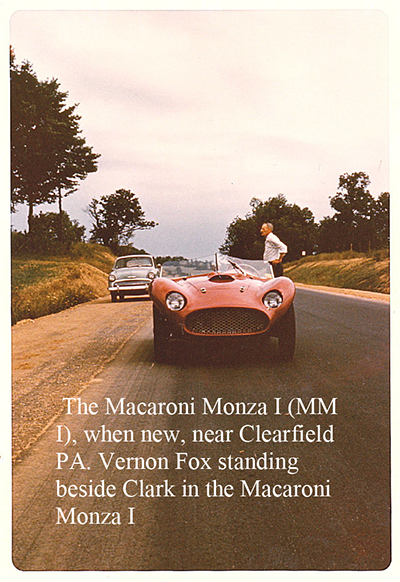 . . Roger said, “You can have it!” (more on this on the page 13) – to Clark re building/ reconstructing that car into his current Macaroni Monza II. Four years went into that recreation. In 1997 it was complete. 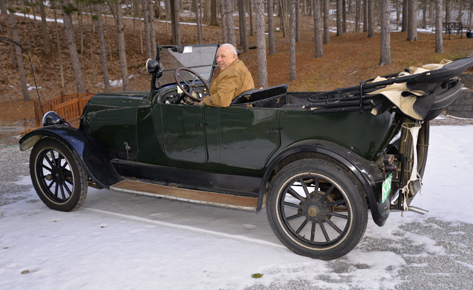 Clark drove his new again MM II from his home near Ausable Chasm NY down to Clearfield PA where it was a featured car in the Central Mountains Region AACA car show. Clark and his car had traveled full circle back to their shared origin. The initial larger bodied Almquist Sportster made in1959 for Roger Adam by Harry Heim Assocs. Mountedon a Henry J chassis with a Chevy V8 that Roger built. 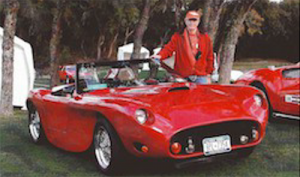 2016 – The Almquist Sportster now – Clark Mitchell with his restored Macaroni Monza II at the 15th Amelia Island Concours in 2010. 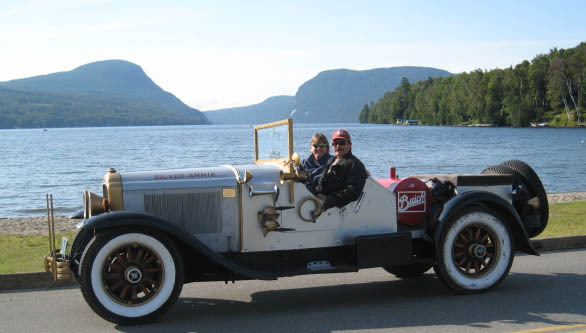 Clark, who is a VAE member, will be showing his car at our 2016 Shelburne Classic Auto Festival this June 3rd, 4th & 5th. The work Clark did after getting his car trailered back home wasn’t really a restoration per se. It was more a synthesizing of ideas about how to revitalize the concept of what Roger had put together thirty-two years prior for his car. 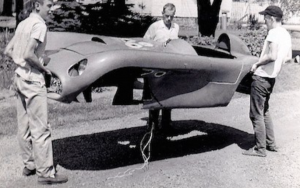 Clark then amalgamated that with his own ideas about how he had set up his original smaller bodied version in 1954. 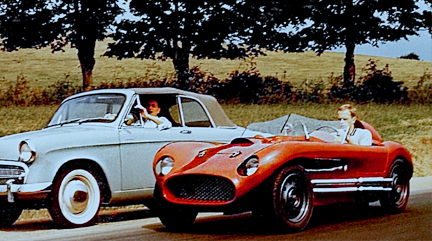 After reviewing numerous old photos of both cars, making sketches from measurements of Roger’s car, and making a small scale model in clay similar to that which Harry Heimand had done for the original fiberglass body, Clark undertook his hands-on reconstruction to fit the 1984 Corvette chassis that would result in the creation of his Macaroni Monza II. 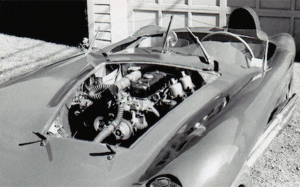 He decided to use the ’84 Corvette chassis following a conversation with a friend who restores corporate jets and suggested that the body shell from Roger’s car would be almost a perfect fit other than needing to alter the wheel well configurations because of the slightly shorter wheel base. 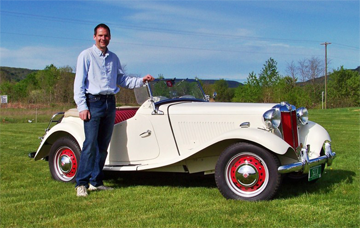 Since completing the car in 1997, Clark has enjoyed participating in numerous vintage car events including invitational showings in concourses at Amelia Island, the Milwaukee Masterpiece, the Hemmings Concours at Saratoga and more. Your writer met Clark six years ago at the Keene Hill Climb Reunion in Keene NY. We had gone over to check out that rather unique vintage event . . . when I first heard the guttural growl of the Chevy V8 as he geared down to pull into the show field. When Clark rolled his MM II into the parking area, I was saying to myself, “WOW, I’ve never seen anything quite like this fifties-styled bright-red roadster coming straight at me!” Once he parked, I went over and introduced myself to begin what has become a fast friendship and shared love of small, low, loud sports roadsters. 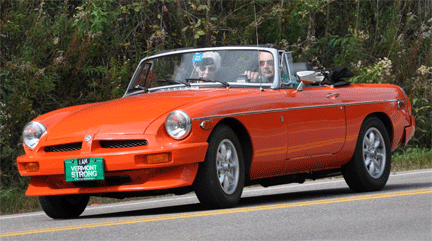 Clark Mitchell & Don Perdue are currently working on compiling a more comprehensive, illustrated history of the Macaroni Monzas to share at the 2016 Shelburne Classic Auto Festival.